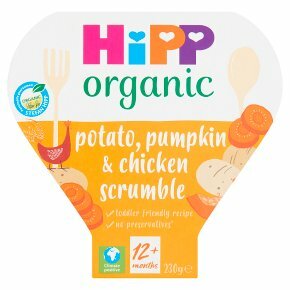 Wholesome and tasty toddler meal. Certified organic. Gluten free. No GM or preservatives. Perfectly balanced with the finest organic ingredients. This product left our factory in a faultless condition - please ensure that the pot and plastic film are undamaged before feeding. Please note: this product contains no artificial colours, but the natural ingredients may cause staining of clothes and occasionally an orange tinge to the skin. This tasty toddler meal can be eaten hot or cold.Always check the temperature before serving. Take care not to overheat, do not heat in a conventional oven. (800w): Remove cardboard sleeve and pierce the film several times. Heat for 1 minute (cooking time may vary according to microwave power). Remove film and stir well to remove any hot spots. Spoon into a bowl or serve directly from the tray. Boil some water in saucepan. Remove the saucepan from the heat source and the cardboard sleeve from the tray meal, then place the sealed tray in the hot water for 4-5 minutes.